Discontinued products have often been removed from the market due to decreased drug utilization and declining manufacturer profits. However, there are often patients for who this product provided the best remedy. Using pharmaceutical-grade chemicals, a specially trained pharmacist with the proper equipment can compound a medication containing the same active ingredients as the discontinued product. 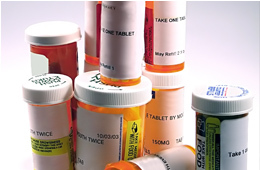 Tablets or capsules are often the form commercially available medication is produced. However, infants and other adults can not swallow or do not prefer this dosage form. Therefore, through the use of compounding, your medication can be made into liquid, suppository, troche, lozenger or other forms to administer the medication. Have your doctor call us and we will be able to assist you with this problem. Do you take a lot of different vitamins or have a skin problem that requires two or three skin preparations. Through the art of compounding, these medications can be made into one base that contains the needed concentration of each of these medications. The result is a medication that is much more convenient to use. A doctor can prescribe any dosage size with the art of compounding for you, regardless of the commercial availability. No more having to take two or three pills. Why not just take one? Are you allergic to a certain type of medication because of a preservative, dye, binder, or excipients in the medication? We can prepare medicines that are free of materials to which a patient is known to be allergic. Have your doctor call us and we can fix it. Having Trouble Taking Your Medicine? Maybe you have a hard time swallowing a certain medication….or perhaps you can’t swallow pills at all…could be, that it just tastes bad. If this sounds familiar, then Martin Avenue Pharmacy can help. Through custom compounding, Martin Avenue Pharmacy can provide oral medications in more enjoyable forms…..like flavored liquids….topical gels….gummi bears…. Lozenges…. Or even lollipops. Imagine …actually enjoying your medicine…! Give Martin Avenue Pharmacy a call at 630-355-6400, and give custom compounding a try. How Many Pieces Make a 1/4 of a Tablet? Are you tired of breaking tablets, or swallowing many capsules for a single dose? Using specialized equipment, Martin Avenue Pharmacy is able to prepare customized dosage forms to meet your specific needs. For example, a medicine may be available commercially only in a 25 mg. and 50 mg. tablet. Yet, your doctor may find that the best dose for you is 40 mg. Therefore, you would need to split the tablet and hope you get the correct dose, but at Martin Avenue Pharmacy we can prepare a dosage form that will contain exactly this amount. You won’t have to take too much medicine, which is wasteful and could cause adverse effects, or too little medicine, which could be ineffective.